These latest figures come from a survey by the Pew Research Center’s Internet Project which was conducted from July 18 to September 20, 1013 among 6,224 Americans ages 16 and older. The margin of error is plus or minus 1.4 percentage points. 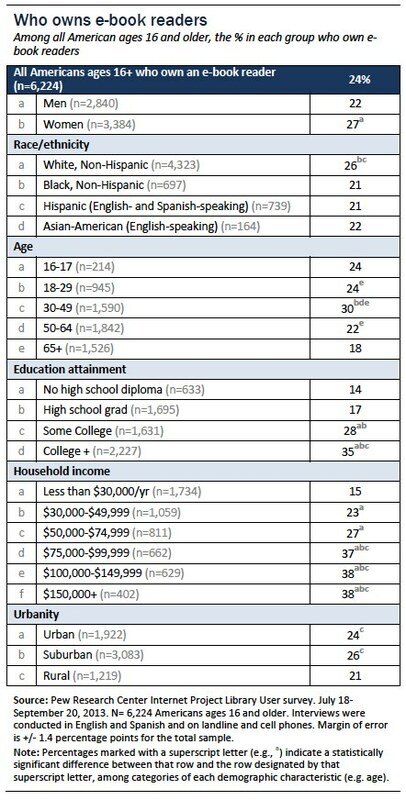 The tables below provide a demographic breakdown of who owns tablet computers, including adoption among English-speaking Asian-Americans because the large survey sample produced enough cases to do a separate statistical analysis. Those who own the devices are especially likely to live in upper-income households and have relatively high levels of education. 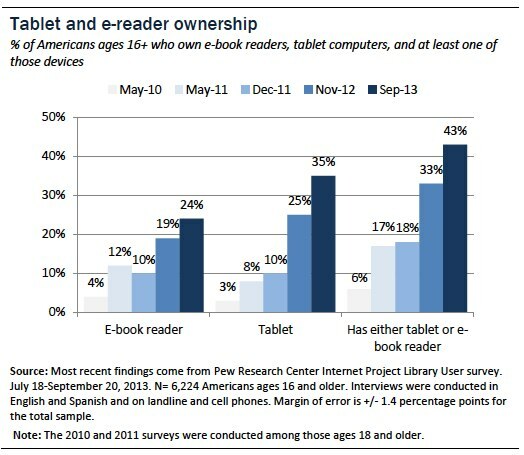 In addition, women are more likely than men to own e-readers. This has also been true in our earlier surveys, including one in May that produced similar results. 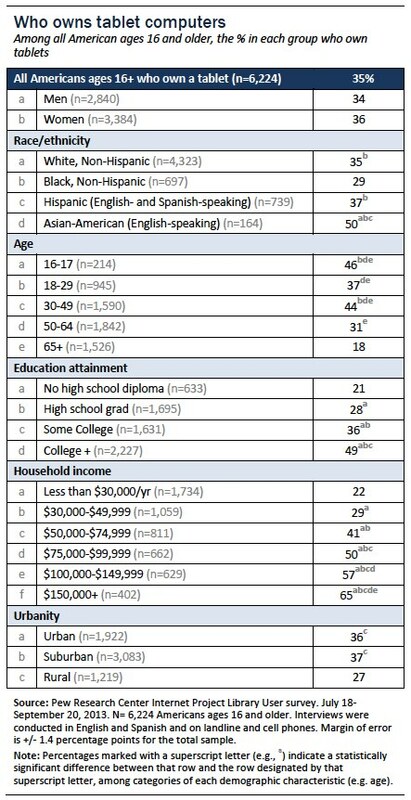 The survey also covered cell phones and smartphones. 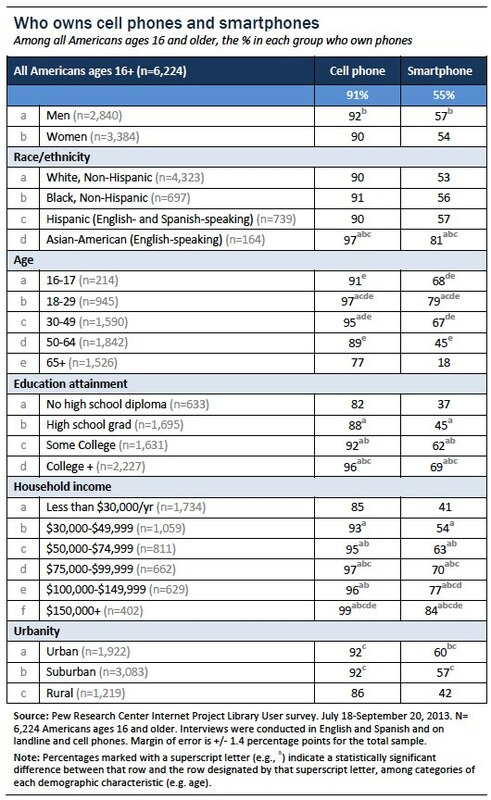 The Pew Research Center’s Internet Project is an initiative of the Pew Research Center, a nonprofit “fact tank” that provides information on the issues, attitudes, and trends shaping America and the world. The Pew Internet Project explores the impact of the internet on children, families, communities, the work place, schools, health care and civic/political life. The Project is nonpartisan and takes no position on policy issues. The majority of support for the Project is provided by The Pew Charitable Trusts. More information is available at pewinternet.org.